Launching a web portal is one of the most crucial moments for a business organization. It is a necessary step to establish a strong presence on the internet. The major object of any website is to generate leads and help with sales. There are various tools available to help you achieve these objectives. One of the most useful options is building AI chatbot. It can not only communicate with the visitors but can also help in increasing the conversion rate. Developing a chatbot is always an enthusiastic job full of fun. But it requires a high level of expertise. This is where the role of chatbot development company becomes indispensable. Because these companies offer expert AI chatbot development services and make the process a breeze. But there are certain rules necessary to follow in the chatbot development services, to make it an asset for the company. Here are the rules that you need to keep in mind while developing a bot. We all know that a chatbot includes writing a perfect line of coding with least or no glitches. But even before that, the idea about the chatbot must be clear with the chatbot development company. The company undertaking chatbot app development needs to have a clear perspective about the final expectations. A chatbot can manage customer queries, return process questions but it’s a much smaller issue to create a chatbot for. For making an impact, a bot should deal with bigger business problems and solve them. The final construction of the chatbot includes steps like building the conversation pattern and the user interface for the visitor to interact. It is the make-or-trash step and requires skilled developers in the chatbot development services. It is more than alright to find a different way to accomplish one task. This is the step in which we integrate the various skills to develop a single process for its refined working and service. The essential part of the chatbot is its training. If the programming of the chatbot is not up to the mark, it will lead to unresponsive chats and a bad reputation for the company. There is an intended customer base expected to interact with the chatbot, and there are some equally expected queries that the chatbot is expected to handle. The developer at the bot development companies train the bots using data extracted from the database and some preset machine learning consulting techniques to provide a personalized reply to the query of the customer. The best training can be done by a user himself who can give an insight to what a prospective customer would expect the chatbot to give. A chatbot should be easily accessible to the users. The bot must be presentable to look at with visual decorations like pictures and graphical elements which will mark a solid impression on the visitors. But we must add such elements according to the type of major customer group it will be dealing with. As discussed earlier, the AI chatbot needs to have a clear vision regarding its functionality. A bot with a clear vision of functionality performs a task with much ease than that which exists only for the sake of increasing technical fame of the web portal. Human language usage is also unpredictable just like its behavior as the short forms used by one person can differ. Hence processing such instructions is difficult and machine learning is in its beginner step. It will take much longer time than expected for software to understand human language completely. So, it is better to develop a dedicated chatbot for each function in the organization. This will make it easier for the customer to interact with the bot, and help in the business process automation for the organization. To maintain any service after its production is one of the biggest challenges an organization has to come across. Similar is the case with chatbot which on deployment, needs proper updates and maintenance for the success to prevail on the web portal. It consists of proper refining of the app by retraining of the module and AI engine and periodic consumer feedbacks to adapt the bot as per their requirement. The customer service bot should be self-sufficient in conversation with the user to provide obvious suggestions in regards to the next task that could be asked to perform. 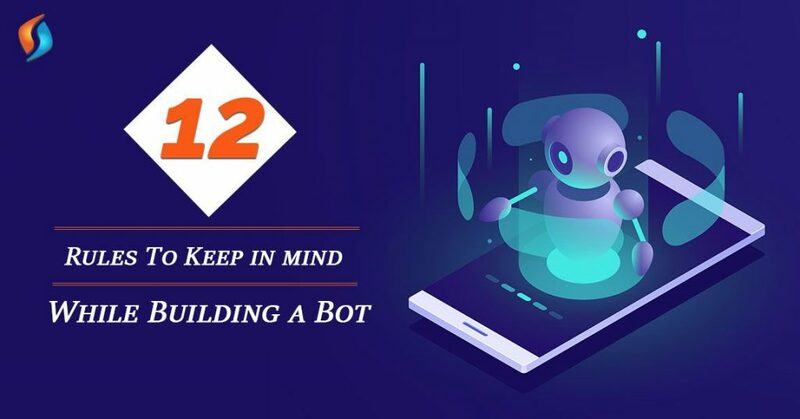 At times, a conversation might be of no use to the user anymore, or the bot might not be able to provide a sufficient answer for the query in which case the bot should restrict the conversation. It will help to add functionality to the bot. A bot should not barge with numerous features that would end up confusing the user on the whole. It should be smart enough to direct the customer to its particular feature attending the query through well-structured messages with proper useful call-to-action buttons. You can also read: How is Chatbot app Development helping in unlocking business value? A short introduction from the bot regarding its capabilities and functionalities will mark a better impression than what anything else could ever do. New visitors should neither feel lost, nor too much bothered. However, it lies in the hand of chatbot’s learning experience with previous consumers. There may be a slightly sluggish response initially, but it will improve later on. Now once the bot has established and gained acceptability among the customer group, extended support from the parent company is expected. Features like help, settings are expected to be there at the top bar of the chat-bot user interface. The CRM chatbot is expected to attend to such call-to-action buttons on priority, and various information must be provided for acknowledging the customers. The bot language doesn’t need to be professional to interact with the users. Initially, the bot can take cues from web tasks to realize the stream of conversation. And later on, learn from them how to carry on with the processing. We create a bot for the sole purpose of catering every customer raising a query. Because it is not possible to employ a large number of human attendants for an infinite number of customers. If the bot says that it is unable to get you, it is much better than ignoring the message altogether. As otherwise, it will cause a negative impact on the customer that he is not important for the company or service. When we personalize the conversation, it helps the customer to stay in touch and come back whenever there is an issue. By taking care of these rules, you can create a chatbot that meets all your expectations. Are you looking for Chatbot development in India? Then your search ends with Signity Solutions. We are a leading name in the field of AI chatbot development in India. We have been helping our clients leverage the benefits of chatbots to the fullest. Contact our IT outsourcing services desk today and realize the full potential of your website.